You've read the analogies which liken the Proverbs 31 woman's servants to our modern gadgetry. Somehow, my washing machine is still not the same as a crisply aproned housekeeper! Yet, timesaving appliances do help us live well on less, by making scratch cooking convenient and big chores do-able by the average family. "The interview--the surest way of finding the right person is through word-of-mouth references." Borrow a friend's new gadget before investing in one of your own. Read reviews on Epinions or Amazon. "Her quarters should be shown and discussed." Make sure you have room for a new gadget. You'll work just as much if it eats up all your work space. "An employee does not train herself." Buying a new appliance will not save you money. Using your appliances saves you money. "Do a time study on your housekeeper, if she says she is overworked." Constantly re-evaluate your resources at hand. Consider picking up a second crockpot, arranging the freezer for more efficient air flow, or hanging the comforter in the sun instead of drying it for an hour. "If you wish her...out of the house at once, ask her to pack up and leave immediately." Don't hesitate to get rid of a dust-gathering appliance, even if it was an expensive gift. An empty counter is more valuable than most equipment. Sell it on Craig's List, Freecycle it, or bless a friend. ---Bread machine conquers my dough-phobia. ---Food processor shreds cabbage and chops nuts for crust in a snap. ---Clean your oven with a shop vac. ---A used Kitchenaid mixer gave me the strength to bake 26 dozen muffins. ---Two wafflemakers and a Waring blender whip up cheap whole grain breakfasts. ---Crock pot chili prevents fast food spending. 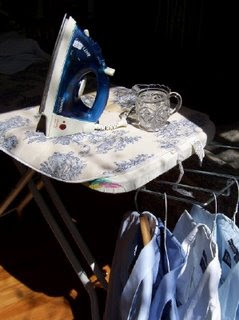 ---The Rowenta iron made me love the smell of starch in the morning. ...not to mention the other gadgets I haven't praised yet--our Wahl home hair clipper, the coffeemaker that fits in the cabinet, the $5 Oreck vacuum, and more. What is your favorite "domestic helper," and how does it save you money? Meredith, this is so clever! My favorite household servant may seem like a frivolous one, but it is the $50 Krups espresso maker. It paid for itself in just two months, as I can make a grande-sized latte in just four minutes, for just pennies. Each latte made at home saves me roughly $3.50. Not to mention making sure I get my milk servings in! This is an excellent way to talk about our appliances and gadgets. I adore my hardwood floor steamer as it makes my floors shiny and streak free. I also love my slow cooker and bread machine since they help to make my dinner more quickly and easily. I *love* my Kitchenaid mixer & can't imagine baking without it! The domestic helper I'm finding it hard to live without is my dishwasher which broke about three weeks ago. I SO underappreciated her! I'm not sure if she saves me $$$, but she sure does save me time & energy & has reminded me that I love cooking & entertaining all the more when I don't have to scrub all the dishes at the end! A strange servant that has worked out well for me is a thrifted PIZZELLE MAKER. I found a simple recipe on Allrecipes (pizzelles III), and that pizzelle maker lets me and the kids put together an elegant cookie with very little effort. In fact, I was thrifting and found a second pizzelle maker. I can now make them twice as fast! * washing machine - I'm really glad I don't have to find a clean river and learn to use a washboard. Actually, if I didn't have a washing machine, I would go to a laundromat, so I save the cost of a washer with a couple of years of quarters and gas. Also, if I was at the laundromat, I'd use their driers instead of hanging everything, and that savings more than makes up for the cost of water. * stove - I think gas is cheaper than firewood or charcoal (and I have easier access to gas) and I know it's cheaper than using an electric hotplate. * microwave oven - I like most leftovers hot, and this lets me have hot leftovers. A stove would work just as well for some of them, not so well for others (like the pancakes I had this morning). Knowing I can heat my leftovers inspires me to cook more, which is much cheaper than eating out. * storage containers - I don't know if that counts as a gadget, but I like to bring one to restaurants and put half my dish into it. I do the same when I make myself a box of macaroni and cheese. If I didn't, I would be highly tempted to eat the whole thing, and then I'd have to pay for another meal later. I also like to put away leftovers in these serving-size containers which keeps me from eating out at work so much because I can just bring a stack of them with me and put them in the fridge at work. My favorite servant is my toaster oven. When the kids were home, it made fast bagle pizza's as well as 6 toast at one time for my fast growing teenage boy. Now that our children are all grown up and married, it still is working (close to 20 years later) making meatloaf for me and my husband (no need to heat up the big oven) as well as typical breakfast fair. Yes, I would have to say my handy toaster oven has earned it's keep. What a great analogy! Great thoughts! Thank you! My favorite house hold servant is my front load washer. I can and do almost twice the size loads as my other washer. It saves on the cost of detergent, water, and time...MY TIME. Also the extra freezer we got again second hand..I buy a lot of food for this day care. Like bakery thrift bread. (I got 3 loaves for $1.00 last week) I also stock up on loss leader items and marked down meat knowing I have a place to keep it. Merideth, I'm loving this series! You have a gift to communicate and your pictures are always so inspiring! Today's article was even better than yesterday's. I knew you would give us plenty of food for thought this week! I'm not at all a "gadget person," but my favorite servant is my big electric roaster. It's big enough to cook for our crew and then some, and during the summer I can put it out on the deck. This saves us money 2 ways: we don't fire up the big oven, and we don't heat up the house during the summer. It also does a great job on most cooking. Meat and baked goods come out moist and delicious! Another one: MY RICE COOKER. I used to make rice on the stovetop ... and I had iffy results: sometimes dry; sometimes gummy; sometimes just right. So, DH got me one of those Black and Decker steamers. Wonderful machine -- rice turns out perfectly every time. And it's good for making hard-boiled eggs too. My favorite servant is the crockpot. I have lived without a dishwasher, a washer, a fridge...(yes, really) but the slow cooker I could never do without. We lived in a motel for several weeks. I made ALL of our meals in the slowcooker. Right now our AC is on the fritz - I've cooked crockpot meals every single day since we moved (on July 1) including lasagna and spaghetti. I loved my rice cooker too. You can make a fantastic cobbler in a rice cooker! But I didn't love it enough to replace it when it wore out - until I find one at Goodwill at least! The servant that I *could* live without but wouldn't want to is the dishwasher. Yes, I can do the dishes by hand, but I find myself avoiding dishes if I have to do that - serving up a sandwich wrapped in a napkin for example. But with the dishwasher, I use real plates for lunch - and make it a "real" meal with a veggie/fruit side. This saves money on junkie snacks and unhealthy lifestyles! This sounds like a silly one - but my clothes line. I LOVE hanging clothes in the summer. For a while we did not have a line outside. I missed it so much. Finally, after much begging, my husband put one up. I love my kitchen aid mixer that my husband bought for me last Christmas. Making homemade bread seems so much faster. I love being able to clean up while the dough is mixing. For our anniversary, my husband bought me a kirby vac. I love it!! It is a bit heavy - but does a wonderful job. Now I have a vacuum for every level of the house. It is wonderful. I guess after reading this my greatest servant - is my husband who makes sure I have the gagets I need to make my "Stay at home Mom Career" as easy as it can be. So thankful for a husband who cares for me!! I know I've said this on another blog somewhere in the blogworld, but I am a crock pot junky. I live in the Southwest and turning on the oven rises our home temp. (which is not good since it is always sizzling outside and the air is on inside). The crock pot helps me to keep house temps at bay and has dinner cooking so I don't have to think about it! Very clever! I've of course heard the analogy before, but you've really done it justice. I don't know what I'd do without my "servants." = "read your instruction manual! Learn how to operate and clean it properly!" = don't leave appliances plugged in if they have standby, and don't feel obliged to use them constantly. Save power. I love my Dyson vacuum. 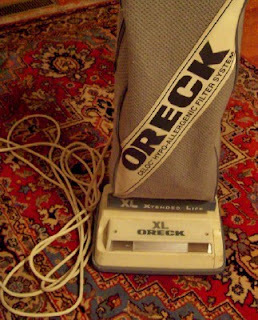 So easy to use and I no longer feel like I'm breathing dust when I vacuum. I nearly died of shock when I used it the first time - so much dirt! I'm coveting a Kitchenaid. A shiny red one. with a grain mill. Your posts keep getting better and better! I love the analogies you have used to get us to think outside the box. Thank you! How did I leave off the computer? That's my biggest servant of all! Now I can add a garment steamer and pizelle maker to my wish list! Like Amy, I am a gadget queen. My husband doesn't mind so long as they don't fall out of the cabinet on his toes! I like this article. Recently I got rid of my microwave oven because it took up SO much counter space and I have a very small kitchen. I realized we only use it once a week or so. I am willing to sacrifice those few times and use the oven instead, for the counter space it gained me to get rid of the microwave. It made room for my bread machine AND a fry cooker! I LOVE that you found your Oreck for such a fabulous price!! I recently found a food processer at a yard sale for $5. It was still in the original box with the blades still wrapped in plastic. A few days later I was at my mom's and noticed her food processer: the same exact one I had bought. I asked her how much she paid for it. She said, "Oh, I got a really good deal on it. It was on sale for $70." I couldn't believe it!! (Neither could she when I told her I got mine for $5.) I love those kind of bargains. My favorite "servant" is my 16 inch electric skillet. I can brown 5lbs. of hamburger at a time to freeze. 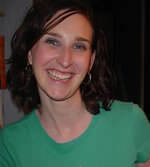 Hi, I'm totally new to your blog. I started lurking about 2 weeks ago. I don't know how you do it. You're like super woman. I'm 22 years old, don't work, attend college, and have no kids. Yet my home is nowhere near as tidy or together as yours. I'm looking forward to great ideas and implementing them around my home. My boyfriend and I are trying to take our spending down, so hopefully I can do that. Just got it out from the garage. It's about 20 years old or more and from my boyfriend's mother. It works great though. It makes cooking brown rice much easier. Also probably about 20 years old, maybe less. It's from the boyfriend's mother also. She lives with us so I get to acquire usage of her old tools of the homemaking trade. We splurged and got a really nice vacuum since our house has two different types of flooring and lots and lots of flooring. Though I was looking at the ways to make it more budget friendly. *Rags, rags, rags, and more rags. They're wonderful everywhere in the home! Gosh, I have so many. But I just got a new juicer so it has to be that. My 2 yr old has not been eating his veggies of late, and I'm tired of not using them all up before they go bad. The juicer is fabulous and my little guy is getting his veggies :) Great article. I am SO loving this series, and I'm INSPIRED as well!!! I don't have a lot of kitchen gadgets and can often be found making pancakes, one a time, in a soup pot~LOLOL! My favorite time in the kitchen was once after our stove died. We have a large kitchen but not much storage space. I told my darling I didn't need a stove, and in its place we put a wooden dresser topped with plug in ranges. (OH the drawers were such a BLESSING!) We bought a little countertop oven, and while it took some planning to cook for all of us, for some reason I LOVED IT!